Tree trunk water feature measures H60cm x W31.8cm x D42cm. Solar powered pump system - no wires and zero running costs. Pump automatically recycles water from a hidden reservoir. Beautifully handmade and finished from weatherproof polyresin. Gentle sound of cascading water creates a relaxing ambience. 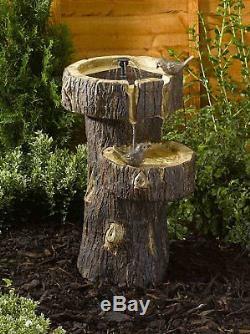 Create a beautifully harmonious yet functional area in your garden with this Smart Solar Tree Trunk Bird Bath. This fabulous practical feature with an underwater integrated solar panel will provide you with hours of pleasure as it recycles water from its hidden reservoir. 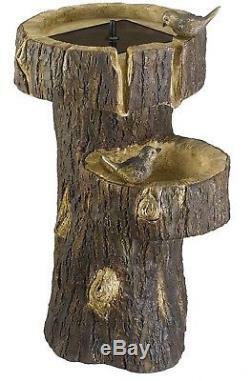 It has been beautifully crafted from resin with an aged finish to create a realistic tree trunk effect with two perching birds adding the finishing touch. It is not only frost proof and weather resistant but also will not chip or crack. Ideal for surviving the ever-changing British weather. This really attractive piece is the ideal choice if you are looking to improve and brighten your outdoor area and is well worth the investment for its durability alone. The location of your garden and the type of vegetation immediately around it will determine what birds will visit your bird bath and in what numbers. Siting of the bath is very important - birds will only use it if they feel safe. Birds get excited and pre-occupied about bathing and tend to be more vulnerable than at other times. Make sure birds have clear visibility as they bathe with bushes or trees nearby to provide cover if alarmed and perches to use when preening. Maintenance-free Operates in direct sunlight No wiring simply install and enjoy No operating costs Includes:1 x bird bath Instructions1 x integrated solar panel1 x low voltage water pump with filter Dimensions: W31.8 x D42 x H60.3 centimeter. Part Number: 1160140RL Item Weight: 9.8 Kg Product Dimensions: 60.3 x 45 x 55 cm Item model number: 1160140RL Colour: Brown Material: Resin, Polyresin Item Package Quantity: 1 Weight: 9.80 Kilograms. The item "Tree Trunk Recycle Water Feature Solar Powered Pump System Garden Birdbath Decor" is in sale since Tuesday, February 6, 2018. This item is in the category "Garden & Patio\Garden Ornaments\Bird Baths, Feeders & Tables". The seller is "nomad-design" and is located in Multiple Locations. This item can be shipped to United Kingdom, Antigua and barbuda, Austria, Belgium, Bulgaria, Croatia, Cyprus, Czech republic, Denmark, Estonia, Finland, France, Germany, Greece, Hungary, Ireland, Italy, Latvia, Lithuania, Luxembourg, Malta, Netherlands, Poland, Portugal, Romania, Slovakia, Slovenia, Spain, Sweden, Australia, United States, Russian federation, Canada, Brazil, Japan, New Zealand, China, Israel, Hong Kong, Norway, Indonesia, Malaysia, Mexico, Singapore, South Korea, Switzerland, Taiwan, Thailand, Bangladesh, Belize, Bermuda, Bolivia, Barbados, Brunei darussalam, Cayman islands, Dominica, Ecuador, Egypt, Guernsey, Gibraltar, Guadeloupe, Grenada, French guiana, Iceland, Jersey, Jordan, Cambodia, Saint kitts and nevis, Saint lucia, Liechtenstein, Sri lanka, Macao, Monaco, Maldives, Montserrat, Martinique, Nicaragua, Oman, Pakistan, Peru, Paraguay, Reunion, Turks and caicos islands, Aruba, Saudi arabia, South africa, United arab emirates, Ukraine, Chile.